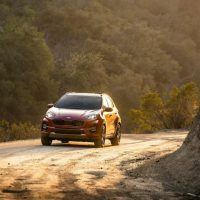 On the heels of an emotional Super Bowl ad for the Telluride, Kia is staying on the gas in 2019. While the Telluride is the largest member of Kia’s house, the Sportage is no couch potato. 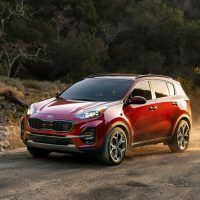 Refreshed and recharged for another round, the 2020 Kia Sportage comes with a handful of tech and safety upgrades. Those not looking for the space (or cost) of a larger SUV may find the new Sportage does the trick. We would opt for the new S trim personally, which has a more athletic exterior look. 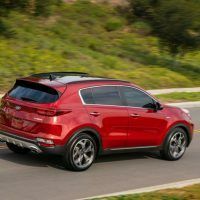 Yet, regardless of trim level, the 2020 Kia Sportage will get the job done on the daily commute. And it will look mighty good while doing it. 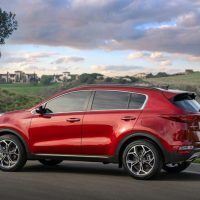 In today’s increasingly crowded SUV market, the 2020 Kia Sportage uses its European flair to stand out. As soon as the pencil hit the design pad, it became about “sweeping lines” and “thought-provoking” curves, says Kia. After establishing the lines and curves, designers went for the proportions and overall stance. Again, the idea was to make the Sportage easily recognizable. Of course, the newly-available 19-inch alloy wheels are hard to miss. The front grille and bumper are both new as are the headlights and projector-beam fog lamps. LED turn indicators, headlights, and fog lamps are optional. We recommend adding each of those lighting upgrades, especially for those who frequently drive late at night. At the rear, the 2020 Kia Sportage receives another new bumper and special taillight trim. A sleek Steel Grey metallic exterior color is also available. 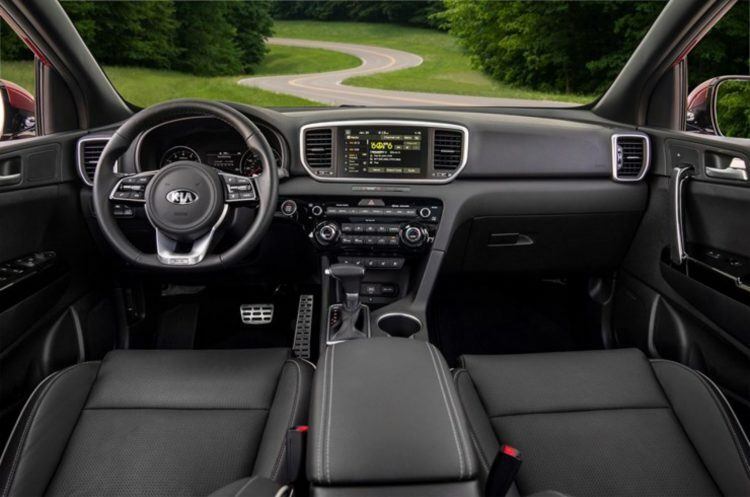 2020 Kia Sportage interior layout. Updates include a newly-designed steering wheel and vent bezels. SOFINO leatherette seating surfaces are available. Photo: Kia Motors America. On the inside, Kia says things are “lightly enhanced” which made us smile. Those “light” enhancements include an eight-inch touchscreen with Apple CarPlay and Andriod Auto standard; modem-enabled telematics and navigation are optional. Those on the go will want the available smartphone charging tray. 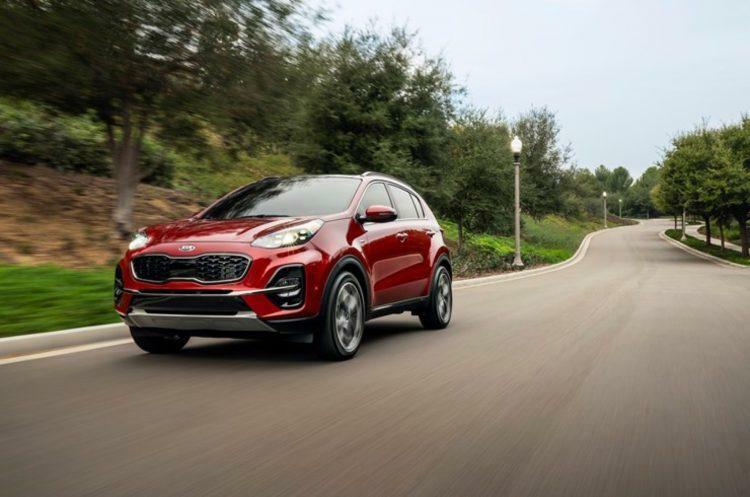 The 2020 Kia Sportage offers two engines and both are sufficient for the daily commute. The more modest 2.4-liter produces a respectable 181 horsepower and 175 lb-ft. of torque. For those quicker jaunts onto the freeway, a 2.0-liter turbo creates nearly 240 horsepower and 260 lb-ft. of torque. While the extra snort of a turbo is always nice, there’s nothing wrong with saving the money and going with the smaller powerplant. Both engines are mated to a six-speed automatic. Fuel economy figures for the 2020 Sportage are not available yet, but it’s reasonably safe to believe the numbers will be on par with the 2019 Sportage. 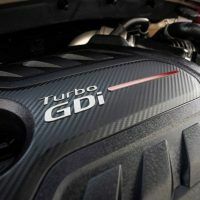 Our only critique here is having more gears “in the box.” An eight or nine-speed transmission would benefit the Sportage in terms of performance and efficiency, but we trust Kia regardless with this six-speed automatic. We’ll look for more gears the next time around. 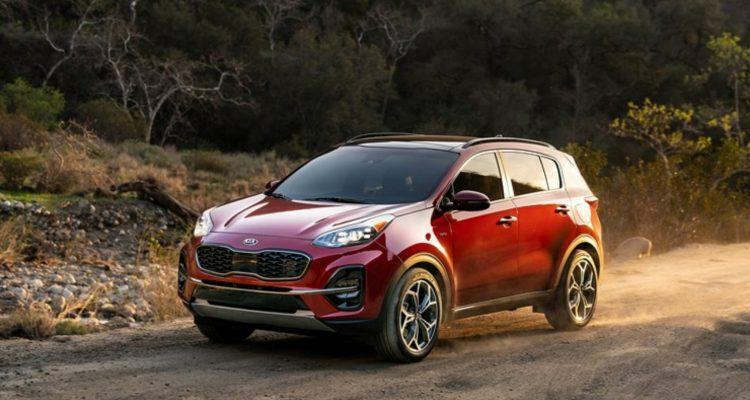 The 2020 Kia Sportage comes in either front-wheel or all-wheel drive. Safety features include Driver Attention Warning, Lane Keeping Assist, Forward Collision Assist, and Pedestrian Detection among others. 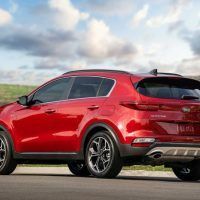 Trim levels include the LX, EX, SX, and the more sporty-looking S. Kia says the new Sportage arrives this spring, with pricing information due closer to then. In the meantime, the 2020 Kia Sportage is on display at the 2019 Chicago Auto Show. 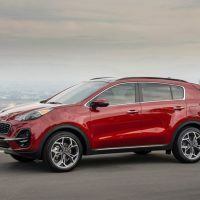 Photos & Source: Kia Motors America. 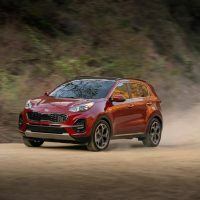 No Comments on "2020 Kia Sportage: Refreshed & Ready To Mingle"